At a recent gathering of the West Hollywood City Council, a representative from Evacuated Tube Transportation Technologies (ET3) said the city was ready for tube travel, the WeHo News reports. Nick Grazilli, a local, told the council that WeHo is the perfect testing ground for a maglev personal rapid transit pilot program–ideally it could connect with the Red Line in Hollywood and the Purple Line when it eventually hits La Cienega. The system would carry car-sized capsules through “an automated tube network without air friction,” topped with solar panels. The system “is faster than jets,” however, the pilot would only travel between 30 and 40 miles per hour, which Grazilli says would enable commuters to cross WeHo in about two minutes (does that add up?). ET3 believess the project could be built with private funds–in less than a year–while those along the right-of-way would share in the revenue. If anyone would say yes to this, it would be WeHo (they have a robot parking garage on the way). No, this isn’t the first time someone has said that pod travel is the answer to LA’s traffic woes. 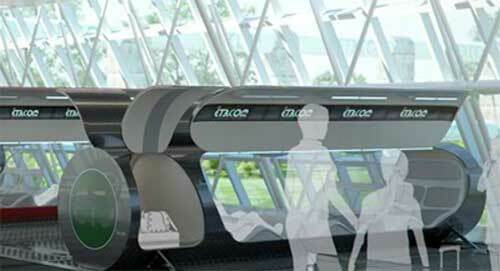 via Maglev Tube Transit Company Wants to Build Pilot in WeHo – Mindblowing – Curbed LA.